CIRCOR Aerospace, Inc., a CIRCOR International Company (NYSE: CIR), has expanded upon the sales representation and distribution agreement with Seal Dynamics for the CIRCOR Aerospace Circle Seal Controls product line based in Southern California. 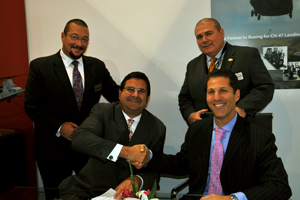 The expanded contract adds global distribution of aircraft galley and lavatory OEM’s to the existing agreement. Seal Dynamics will continue to increase customer connectivity and market presence for the CIRCOR Aerospace / Circle Seal Controls’ line of specialized fluidic controls components, manifolds and subsystems. “Seal Dynamics and their international network continue to drive increased customer awareness of the Circle Seal Controls line of products and capabilities,” said Michael Dill, CIRCOR Aerospace Vice President of Business Development and Strategy. “We are pleased with the team effort and will continue to increase the global reach CIRCOR Aerospace will gain from our partnership,” said David Susser, Seal Dynamics’ CEO.